The French figure skating family is still waiting for their first individual Olympic gold medal. 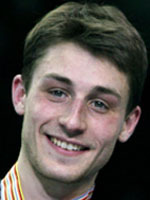 Brian Joubert has everything it takes to end this drought. He has been on every continental podium since 2002, winning three European titles (2004, 2007, 2009) and his first world title in 2007, but it is the Olympic gold he really wants as the Vancouver Games beckon. With 13 international medals, eight in Europe and five at the worlds, he is already the most decorated skater in French history. If he goes the final step on the Canadian West Coast in 2010, his place in figure skating folklore will be complete. European bronze in 2002 at Lausanne, silver the following year at Malmo and finally the continental gold at 19 in 2004 at Budapest, his rise has been steady and sure. Two months after Budapest, he was world silver medallist thanks to his courage and masculine style that helps the Frenchman stand out from the pack. He is also a great jumper and gives off a presence of assuredness. After his early success, he suffered his first real disappointment at the 2005 worlds where long-time rival Yevgeni Plushenko pulled out injured, opening the door for the man from Poitiers. However, he caved in during his free programme, falling twice and thereby handing the gold to Switzerland's Stephane Lambiel, finishing a lowly sixth himself. The following season, now under the management of Russian Andrei Berezintsev, Joubert again picked up European bronze and world silver but at the Turin Games and once again under massive expectations, he messed up badly to finish sixth. Another switch of coaches followed as he linked up with another former champion Jean-Christophe Simond. The 2007 season brought his finest hour when he won his second European title and in March at Tokyo, skated to the first world title won by a Frenchman since Alain Calmat, 42 years earlier. The best quadruple jumper in the business and back on top of his mental game, Joubert appeared unbeatable but he hit another black patch in 2008 when he finished third at the Europeans and second at the worlds behind Canadian Jeffrey Buttle. He also ran into a wave of criticism from another rising Canadian Patrick Chan who said Joubert was a bad loser. Joubert brushed the critics aside to win another European title in 2009 but at the worlds in Los Angelas where he was favourite, a fall relegated him into the bronze medal position behind Chan and winner Evan Lysacek of the USA. Joubert has an open road to the Olympic gold but questions remain over whether he can handle the cauldron of pressure on the biggest stage of them all.